Acts of harassment and discrimination should never be excused or tolerated. They should be reported, managed, and appropriately enforced. 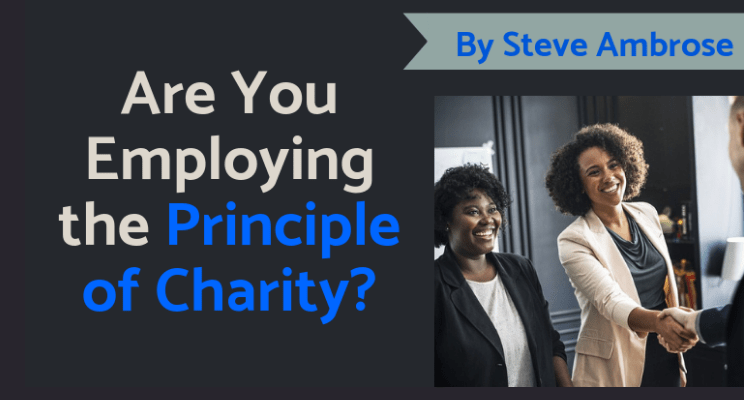 The Principle of Charity is a useful precept and communicative strategy. It is often underused in the workplace and our society. To start, you may know that I co-founded a growing movement & learning organization for civility and inclusion. One which advocates consistently practicing and being accountable for better habits of engagement within the diverse views and opinions of others. As a part of this effort, I stay abreast of the work from many HR, culture, and Diversity & Inclusion leaders. Some as colleagues and friends, who offer keen and powerful insights. Diversity in the workforce is turning a corner. For example, this 2018 study from BCG reflected upon 1,700 companies from 8 different countries. The biggest takeaway was that innovation revenue was 19 percentage points higher from those companies with above-average diversity in management vs. those with a diversity mix at below-average levels. Such studies are heartening, but it’s only a focused pittance. Chiefly because there exists a pervasive challenge that has and will continue to stymie the numbers of such positive studies and results. Namely, our company and people leaders who focus far too much on diversity and far too little on inclusion. As noted by workforce strategist and author Glenn Llopis, this lopsided focus can result in losing the mega upside potential of organizational growth via improving and optimizing inclusion. “You might have a functional area devoted to making sure the company has systems for ensuring inclusion. That department might be seen as a cost-center. Additionally, Llopis notes focusing too much on diversity can lead to increased marginalization, victimization, and defining individuals in the workplace largely by their differences. “In some ways, diversity is about counting, so like, we have one of those, we’ve got two of those, we’ve got three of those. But inclusion is about cultivating, and I think that’s the difference. So we need to raise the level of inclusion beyond our company’s core values laid out in legalistic policy and fancy wall plaques. To help organizations transition beyond diversity 1.0 and move into the rock-solid, sustainable, and growth-catalyzing Inclusion & Diversity 2.0. Microaggressions and micro-inequities happen largely due to a number of held cognitive biases. They are formed from our environments and experiences. These biases create filters that impact the already unique lenses of how we see and interact with others. 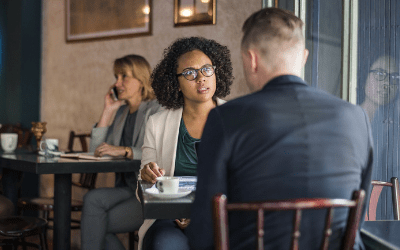 We must not only question personal biases that can lead to microaggression but also question other biases in how to best approach those who commit these slights against others. For instance, should a first-time micro-aggression result in a receiving party’s response to directing anger, blaming, shaming, or shunning to the transgressor? Perhaps reporting them to a manager or HR? Can organizations teach and expect employees to take these slights and subtle blows as new opportunities for growth? To strengthen empathy, understanding, and focus on raising both peer-to-peer and organizational inclusion as a whole? This is where the Principle of Charity comes in. It is a precept used within general communication and rhetoric. A generosity of spirit where in the face of receiving an initial microaggression, one should make the choice to interpret other people’s statements in their best, most reasonable form. In no way am I suggesting that we ignore a microaggression or casually provide a transgressor with the benefit of the doubt – and simply move on. However, I’m also not suggesting you snub them – or choose to label their character or intent based solely on that single mistake. Instead, become empowered and take on a personal ‘investigation by communication’. A tactful and structured engagement whose success depends largely on the way you frame the conversation, and how they choose to respond. I strongly advise against confronting the transgressor immediately after the microaggression event. Often, the receiver is emotionally charged and may seek to lash out in lieu of more productive listening to, learning from, and teaching to others. Step back from your initial need to fight back by practicing greater mindfulness and emotional intelligence. Be strategic in presenting your thoughts and feelings with a calm focus…at the right time and in the right place. Maybe that’s over lunch the next day or in a conference room later in the afternoon. Perhaps over a morning coffee. Tell the person that what they said was offensive. Perhaps even more important, seek to frame this as to how their actions or words could hurt them in the future. Allow them a chance to react and explain themselves – and do not interrupt. Be a good listener. Let them speak and share their thoughts – as it lends to healing and change. And don’t worry – you will likely not only receive an apology – but several of them. I would not recommend an email medium for this unless you absolutely feel as though you cannot speak with them face-to-face. Eye-to-eye contact is extremely important in engagement. Obviously, if they react with hostility, treat you poorly in response, or thereafter alter their relationship with you for the negative, you handle that with the help of others in your organization. Remember, there are good people out there who make mistakes and do insensitive things. Truly recognizing this is at the core of a generous spirit employing the Principle of Charity. We know that one doesn’t just become a good parent because they ARE a parent. There are mistakes made, and lessons learned. As lessons are willingly applied, habits and behavior change. This helps the parent, their children, as well as others whose lives they touch. 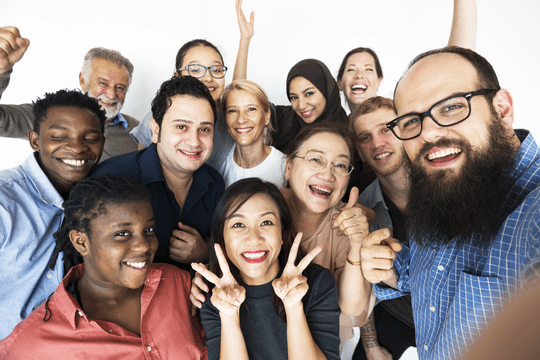 It is so important to remember that just because the company or HR leaders set a policy of inclusion, employees and leaders will not simply snap into losing their biases. To operate as an army of programmed drones. This genuine realization is where companies can fall back upon the power of peer-to-peer communication, teaching, and learning to strengthen organizational inclusion as a whole. To teach employees at certain times, to step beyond their short-term emotional surge. To recognize the power of a strategic moment of learning. Once again, I am in no way advocating for harassment, discrimination, or multiple microaggressions made by the same transgressor. All of these behaviors must certainly be reported and dealt with in a swift and just manner. Think of all the many millions of microaggressions and micro-inequities that happen each and every day in the business world. Now ask yourself…if only 10% of these events became peer-directed teaching and learning opportunities, how much our workplaces, communities, and employee engagement could benefit. To genuinely bond more strongly through genuine inclusion within our diversity and unique differences.